I recently discovered Faith Erin Hicks when I picked up a copy of The War at Ellsmere from the library. And what a delightful discovery it was! I so enjoyed that book and its quirky combination of humor, suspense, engaging characters and relationships - along with a dash of the supernatural - that I knew I had to read more. I was pleased to discover an additional book in my library's collection - her latest, Friends with Boys. And I have to say, I enjoyed this one even more. Our heroine is Maggie who, after years of being home-schooled by her mom, is on the brink of starting high school. Her older brothers, who have gone through the same process, understand a bit how she is feeling, but for Maggie the change is more complicated and distressing: her mother has decided to take a leave of absence from the family, leaving Maggie on her own with her dad and older brothers. 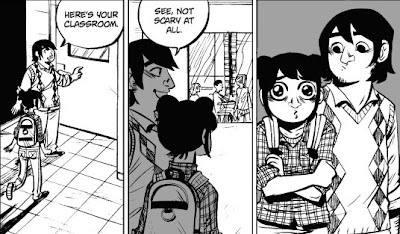 Maggie finds the first day of school extremely daunting, and to heighten her stress, she discovers that a ghost is haunting her. It is interesting and a bit confusing to Maggie to see her brothers interacting with other kids at school. Clearly there are back stories and relationship issues her that she doesn't understand. Maggie has never really had other friends before, aside from her brothers, and when she does finally click with Lucy, another girl at school, she realizes that there are some issues between Lucy's brother and her own. 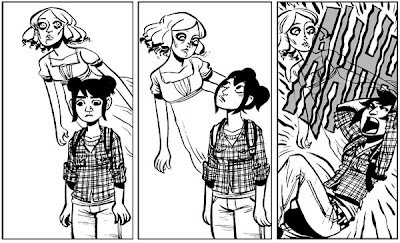 Again I was struck by the wonderful balance between humor and drama, the mysterious and the mundane, that Hicks manages to strike in her graphic novels. Maggie is a delightful character, discovering things for the first time that will be all too familiar to many teen readers, but who will, thanks to Maggie's enthusiasm and sensitivity, view them in a new light. I love when books do that. Zombie fans will delight in Maggie's school musical, and fans of Alien will find Maggie's Halloween trip to the movies making them laugh out loud. As with The War at Ellsmere, Hicks could easily have fallen into plot predictability, but she never does, deftly maneuvering the story into unexpected - and unexpectedly moving - directions, without ever being heavy-handed or maudlin. This is one of my favorite reads of the year, and I have broken down and purchased her first book, Zombies Calling, because my library does not own it. I will see if I can remedy that, too, but I was too impatient to read it to wait out the possible purchasing process. 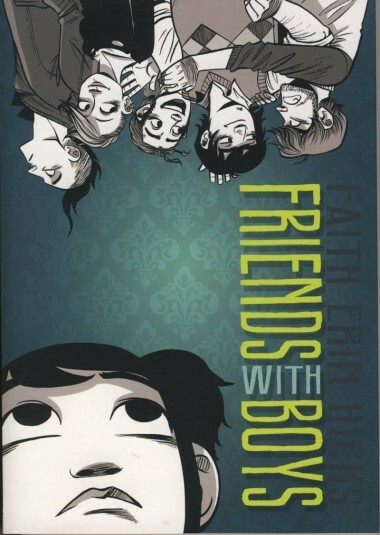 This would be an excellent choice for readers curious to try out graphic novels - great characters, interesting story, and expressive, energetic artwork. What's not to like? I love her too! And I read the books in the same order as you as well. Though Zombies Calling is her first book, it ended up being my favourite of three! I'm glad to hear that you enjoyed the first one so much. I haven't read it yet, but I'm really looking forward to it. I may have to buy this one as well - I just loved it and know I'll want to read it again.